The CLIMSOM mattress topper allows you to cool the place where you sleep: the surface of the mattress where you sleep every night. You can then lower or turn off the air conditioning or the heater at night for substantial savings. Many are choosing less traditional air-conditioning systems. Since most air conditioners lack the ability to purify the air that gets recirculated, they contribute to respiratory disorders, sleeping disorders, and mite proliferation. Furthermore, an air conditioner and a heater let you choose the temperature of your bedroom but not that of your bed, the surface in contact with your own body. It often leads to the bed still being too warm despite the air conditioner being run excessively in the bedroom. 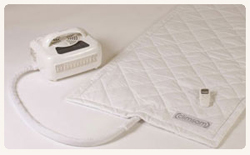 CLIMSOM is a mattress topper that fits on your mattress under your fitted sheet and allows you to cool or to warm your bed to your desired temperature. CLIMSOM is cheaper than an air-conditioning system, features immediate installation, and is easy to use. It offers substantial energy savings on heating and air conditioning. The device is also more discreet than an air conditioner. Its sound level is below a fan or a small air conditioner. Its startup can be postponed, even to a time when you will already be asleep if it is absolute quiet you desire. Furthermore, the thermoregulation offered by CLIMSOM is a natural method of well-being that will help you to limit medicines such as sleeping pills, myorelaxants, analgesics, or even mentholated gels in the case of venous incapacity. We spend about 1/3 of our time in bed. Our sleep and our bedding deserve our attention and care. To sleep better is to be more effective during the day. Even beyond the comfort and the savings, you'll get so much more out of your days after a good night's sleep.